Le Podere Tegline est une «ferme biologique qui produit du vin, de l'huile d'olive extra vierge. Vous pouvez également déguster le miel, le lait, le fromage et le fromage de chèvre. Il a une ferme avec quatre appartements pouvant accueillir jusqu'à 11 adultes et enfants de moins de 12 ans. Au milieu des vignes toscanes donnant sur le lac, les chambres et salles de bains avec tout le confort et les meubles anciens, les salons et les cuisines prêtes à l'emploi avec des jardins bien entretenus. Barbecue, terrasse ensoleillée surplombant le lac, d'une demi-heure entre Florence et Sienne. Accès Internet dans toute la maison. Dégustation de vins et cours de cuisine. Ceci est l'appartement appelé Tegline le plus grand de la ferme (97mq), même dans ce que vous pouvez lire l'histoire du passé. Il est doté d'un grand et lumineux séjour (m². 33) avec accès à la loggia extérieure et la cuisine bien équipée et d'une cheminée où vous pouvez allumer un feu et faire cuire. Un couloir mène aux deux chambres originales les deux des doubles, chacune équipée d'une salle de bains privée, une avec le vieux puits à l'intérieur et une douche, tandis que l'autre, grande et spacieuse avec salle de bain, tous deux décorés de mosaïques. En dehors de la belle loggia avec table et chaises où manger et se détendre au coucher du soleil ardent de soirées d'été. Au coeur du Chianti Classico, à proximité de tous les villages médiévaux de Chianti: Greve in Chianti, Radda in Chianti, Gaiole in Chianti, Castellina in Chianti. endroit idéal pour des excursions à Florence, Sienne, San Gimignano, Pise, Lucca, Arezzo, Les Cinque Terre, Terme di Saturnia et Petriolo. Deux salles de bains avec lavabo, bidet, wc, une avec douche, l'autre avec baignoire. Nous organisons des dîners à thème avec de la musique, des cours de cuisine, le vin et l'huile cours de dégustation avec une visite à la cave, visites de vignobles et des processus d'explication. Indications historiques et géographiques. conseils d'affaires, points de vente, des dégustations de vins et des restaurants. Beautiful and Perfect Location for a Tuscany Adventure! The Farmhouse is a very charming, very relaxing, very beautiful place to stay in a classic farmhouse setting for a visit to the Tuscany region. 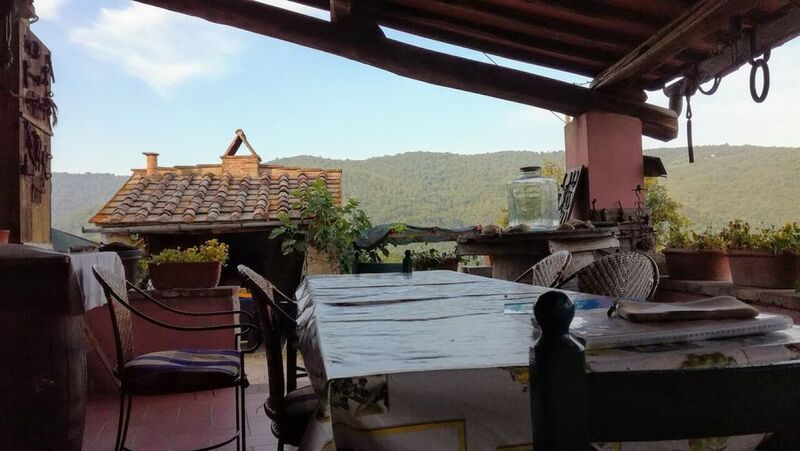 The location, approximately 30 kilometers south of Florence, puts you in the heart of the Tuscany region and very drivable for day trips to the many main attractions and places. We easily visited one to two locations daily, with time to relax at the farmhouse in the evenings or take dinner at one of the many resraunts in the small villages within short drives from the farmhouse. Many vineyards are located in the area so any short drive, in any direction, provides the iconic Tuscany views the region is famous or opportunities for wine tastings. We were two couples and choose to have a bottle of wine produced and bottled from the Farmhouse Podere Tagline vineyard each evening while star gazing from the terrace or taking in the beautiful long range views at sunset. Our party of two couples stayed in the Tagline apartment. This apartment has 2 bedrooms with attached full bathrooms, a large living area opening to a large covered poarch with a table and comfortable lounge chairs for relaxing. It also had a full kitchen if you would like to cook. The apartment was well stocked. The accommodations were perfect for an extended stay with ample room for privacy between two couples. Simonetta and Giovanni Talluri are very gracious and loving persons. They were helpful from the first corespondents, answering questions and providing valuable suggestions on most everything; many which we took. Giovanni shared history about the region and the farm that was most interesting and educational. We choose to have dinner with the family one evening. It was outstanding! It included regional foods, wines from the farm's vineyard and delightful conversations about the farms history, wine and olive production and family history. In fact, our hosts made us feel as if we were family. We celebrating a birthday for one of our party during the dinner! Simonetta and Giovanni worked very hard to make it special, and it was! We all left with fond and special memories of the Talluri family and farmhouse, the Tuscany region and, the wish that someday in the future we may return for another visit to renew friendships and the many good experiences. Thank You for your wonderful hospitality and stay. Peace and quiet, serenity, wonderful hosts, beautiful scenery, and a great location are just a few of the many things that make this farmhouse unforgettable. Simonetta and Giovanni make you feel like family the moment you arrive. Our only regret is we could not stay longer. Thank you for an amazing experience! It was a great pleasure to have you and your family with your two little kids in our house. Sometimes people come only to rest and to leave in a quite place as family with little kids especially for the mother. You can visit in a few minutes by car the small Chianti villages nearby as Radda in Chianti, Castellina in Chianti, Greve in Chianti eating a good ice cream, or a good pizza, drinking a good glass of wine that you find in our farm or everywhere. A simple life to recuperate energy to come back home. We try to help you to do only what you need. summer red sunset waiting for the swallows flying to drink. Very beautifull nature, good temperature, a typical tuscan appartment to live in. At night, cool enough to sleep. Many beautiful villages in the surrounding to visit and not to forget Firenze, Siena and Pistoia. We appreciated also the swimmingpool near to Castellina. Thanks to the information of Simonetta we saw and listened to performances we would otherwise never have seen. many thanks for your kindly words. It was a great pleasure to meet you and your family. We are happy that you appreciated our suggestions to make a real holiday in Chianti's Hills. The farmhouse Tegline is a quite place , perfect for couple and for family that prefer to relax , taste a good glass of wine, immersed in the nature. We hope to meet you again one day. Altes Landhaus mit ganz viel Charme. Absolut ruhig inmitten der Natur gelegen. Thanks for your review! It was a great pleasure ta have your family in our ancient house. Happy that you have appreciated the value of Tegline: nature, quite, peace and our welcome. So sorry this time I could not visit you because of the problem on my back, but I know that my whole family help you. Tuscan is a rarety of landscape, art and culture and our organic wine and extra virgin olive oil transform your holiday in something special. Hope to meet you again ! It's an Italian home, and you become part of it. What better way to experience the heart of Tuscany than to stay in a 21 century old Etruscan tower converted into a farm house, passed down from generation to generation.. It's the quintessential Chianti, surrounded by hills, vineyards, olive groves. Slow down, open one of their wine bottles and enjoy the sunset. Lovely apartments, modern facilities with old world charm. We lacked nothing, Simonetta was always there to fulfill our wishes. She had great insider information and daily tips. It seems worlds away from the busy tourist areas, yet Radda is only 5 min away, charming Chianti town, often missed by crowds. There's no better place to experience Tuscany how it really is, beyond the masses. We'll surely come again! We are so happy knowing that all our efforts and attentions to our guests are very appreciated. We always try to tell everything about our style of life, wine , extra virgin olive oil and food exchanging with the other countries cultures. For us it was really a great pleasure to meet you and your wonderful family and we hope to meet you again for new experiences to live together. Le Podere Tegline est immergé dans une oasis de 47 hectares au sommet d'une belle colline du Chianti. Silence, nature et une grande paix, dans la seconde période, nous fournira toutes les informations des événements dans notre région qui rendront votre séjour inoubliable. Nous sommes dans le coeur du Chianti, en dix minutes en voiture, vous pouvez visiter les villages médiévaux: Radda in Chianti, Panzano InChianti, Greve in Chianti, Castellina in Chianti, Gaiole in Chianti. Art, culture et bonne nourriture que vous rencontrerez partout. Excellente base pour des excursions vers les villes d'art célèbres comme Florence, Sienne, San Gimignano, Pise, Lucques, Arezzo et même Cinque Terre, Terme di Saturnia et Petriolo. ll prezzo si intende per l'affitto dell'appartamento e comprende: linea wifi nella casa, parcheggio esclusivo, acqua, luce, gas cucina, biancheria per camera, bagno e cucina, pulizie finali. Non inclusi: la colazione, il costo di riscaldamento che è a consumo 5.00 Euro al metro cubo di GPL da saldare alla partenza. Non si usa sicuramente da maggio a ottobre inclusi.